Highlighting Cuba’s support for what he described as “the former Maduro regime” and arguing that Cuba’s “main export is oppression”, which “directly threatens U.S. national security”, Secretary of State Mike Pompeo announced in a five-minute press briefing in Washington Wednesday morning that the Trump administration will implement Title III “in full”, effective May 2. Pompeo did not take any questions. Later that day, during a speech to Bay of Pigs veterans at the Biltmore Hotel in Miami, National Security Advisor John Bolton announced that Treasury Department measures are pending to further restrict non-family travel to Cuba he described as “veiled tourism”. He did not elaborate. He also said that remittances to Cuba will be capped at $1,000 per person every quarter. 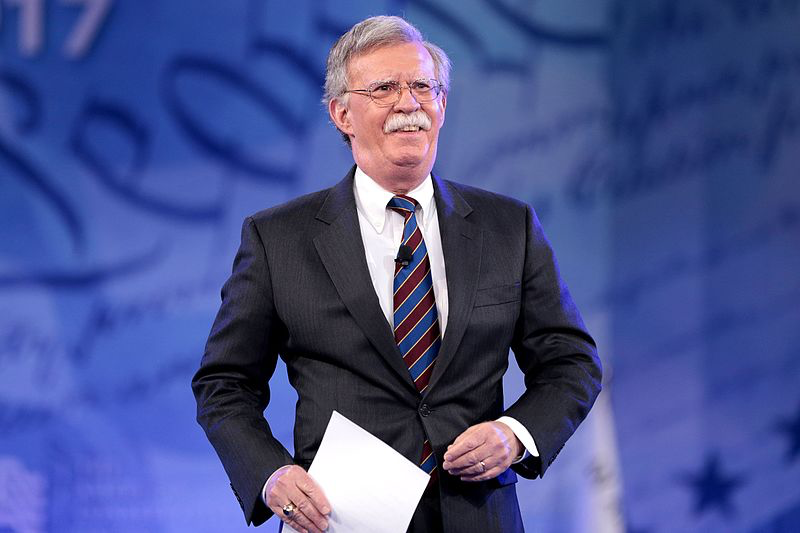 Bolton did not mention any plans to return Cuba to the State Department’s list of “state sponsors of terrorism”, as some observers fear. Quoting an official who spoke on condition of anonymity, the Miami Herald reported that U.S. travel to Cuba will be limited to family visits. At closing of the New York Stock Exchange the same day, shares of cruise giants Royal Caribbean Cruises Ltd., Carnival Corp. and Norwegian Cruise Line Holdings Ltd. were all down. Referring to a U.S. policy dating back to 1832 that is commonly rejected in Latin America, Bolton ended his speech declaring that “the Monroe Doctrine is alive and well”, suggesting that the United States will take measures against any outside power trying to influence nations in this hemisphere. Rodríguez highlighted Cuban families, private businesses in Cuba, and U.S. citizens whose freedom to travel is further restricted. In a tweet, the foreign minister called the measure “an attack on international law, and on the sovereignty of Cuba and other states”. The Trump administration will also begin enforcement of Title IV of the 1996 law, a senior official who spoke on condition of anonymity said on Tuesday. That provision blocks U.S. travel by executives of companies accused of “trafficking” in Cuban properties. Activating Title III is part of President Trump’s rollback of Obama-era detente with Cuba, that official said. Concerned about backlash from close allies, as well as from certified claimants worried about messing up the legal process, all presidents since Bill Clinton have routinely suspended Title III of the Helms-Burton law. 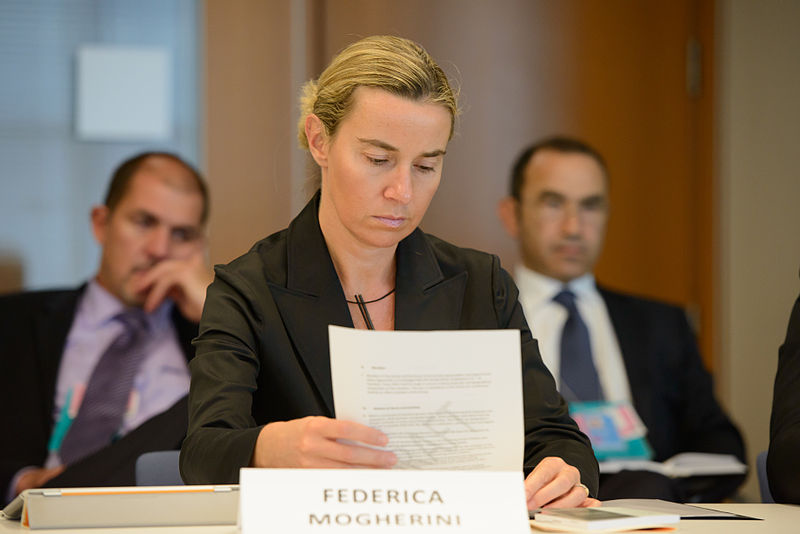 But the Trump administration is forging ahead even though European Union leaders and the foreign ministers of Canada and Spain have made clear their opposition in the run-up of the announcement. 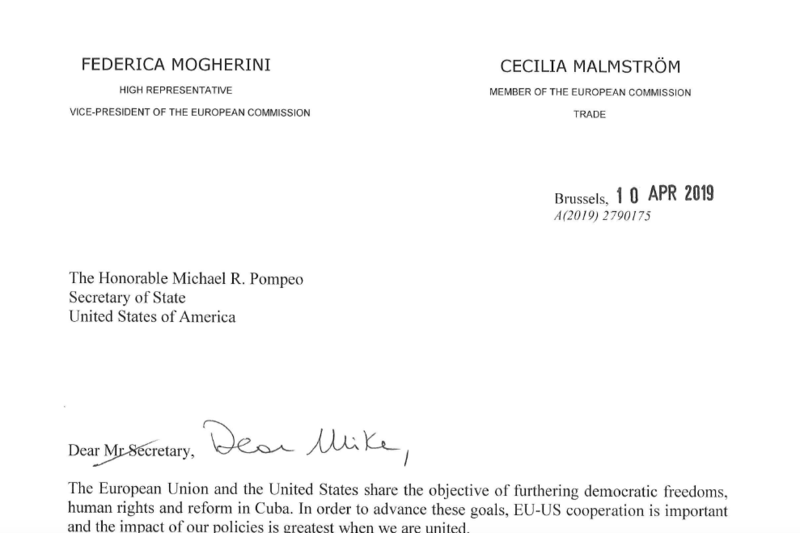 In a letter to Mike Pompeo April 10, EU foreign policy chief Federica Mogherini and EU Trade Commissioner Cecilia Malmström said the bloc might file a complaint with the World Trade Organization (WTO) and predicts counterclaims against U.S. companies in European courts. The two EU officials called on Washington to honor a 1998 agreement to grant a consistent waiver for EU companies and citizens while the bloc suspends a WTO challenge over the issue. 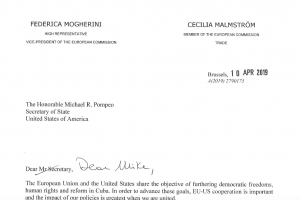 The letter also said that EU courts were empowered to allow EU companies to recover any losses caused by claims over Cuba, adding that an overwhelming majority of the 50 largest U.S. claimants, making up more than 70% of the value of claims, had assets in the European Union. In a joint European Union-Canada statement on Wednesday, Mogherini and Foreign Minister Chrystia Freeland call the U.S. measure “regrettable” and that they are “determined to work together to protect the interests” of their companies, warning that EU and Canadian laws allow counter-claims against any U.S. lawsuits. Property confiscations are generally considered part of the national legal realm of each country. The Trump administration is aware of European opposition, the anonymous U.S. official said during the Tuesday briefing. 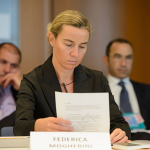 The Europeans are entitled to sue or file a WTO complaint, but they “will fail”, he added. 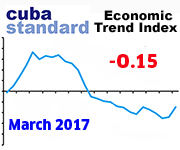 The measure will only cause a “bump” in the business community, but have an economic impact on Cuba and show U.S. resolve, the official said. The U.S. Chamber of Commerce disagrees. “It is ironic that President Trump would make this fringe decision after the Trump Organization worked for years to open a Trump Hotel and golf course in Cuba,” Williams added. The Russian government reacted by declaring the sanctions “illegal” and by stepping up help. Deputy Foreign Minister Serguei Riabkov assured Cuba that his government will “do everything possible to help Cuba and Venezuela,” Cuban Foreign Ministry General Director of Bilateral Affairs Emilio Lozada García said in a tweet. To be sure, the actual impact is hard to predict. While it has added general uncertainty, a partial lifting of Title III in March that allows U.S. lawsuits against some 200 Cuban entities affiliated with the armed forces has not produced a single lawsuit in the four weeks since, says Robert Muse, a Washington-based lawyer. No matter whether they produce billions of dollars in judgments against foreign companies or not, the lawsuits are expected to slow down Cuba’s efforts to attract foreign investment. Even though Title III shields companies that use confiscated assets in connection with legal travel, it could also affect U.S. airlines, cruise companies and particularly one hotel operator that flocked to Cuba during the Obama administration. It is hard to predict how Title III will play out in U.S. courts. 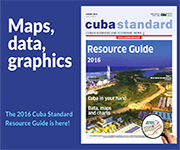 There are close to 6,000 registered claims in the U.S. register, for an estimated total of $8 billion; however, Title III would also allow non-certified claims holders, who were Cuban nationals at the time of confiscation, to sue. In a Q&A after Pompeo’s remarks, Assistant Secretary of State Kimberly Breier said that holders of up to 200,000 uncertified claims, “valued easily in the tens of billions of dollars”, could file suit. She also said these claims could eventually be certified. Also, the administration has yet to reveal what kind of entities could be sued. Adding uncertainty to the impact, in the 1990s, Canada and the European Union introduced measures in response to Helms-Burton that block enforcement of U.S. judgments in Europe and Canada. Finally, Cuba — which has settled claims with all nations except the United States — has a law on its books dating back to 1996 that eliminates from future compensation any claims holders who sue in U.S. courts. “Anyone who uses the processes and mechanisms of the Helms-Burton Law damaging others will be excluded from possible future negotiations,” the foreign ministry said in a statement in March. Toronto-based Sherritt International, probably the foreign company most heavily invested in Cuba, said its business will “not be materially impacted”, Reuters reported. 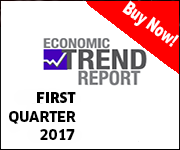 The company will “continue to operate as usual” and “focus on meeting its nickel/cobalt production targets”. 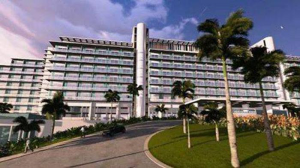 Spain’s Meliá Hotels International — the biggest hotel management company in Cuba — said that the Title III activation will not change anything in how it does business in the island. 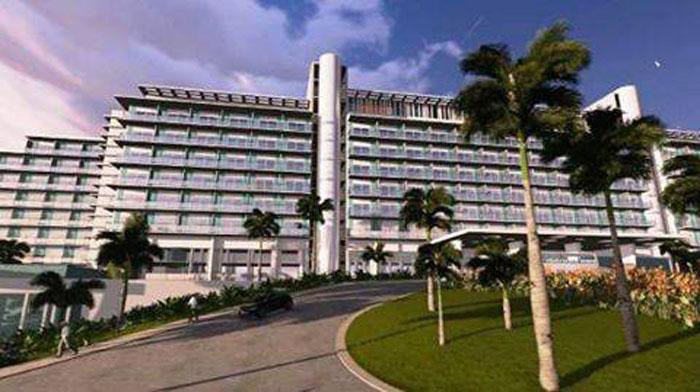 “Cuba is an exceptional destination and must remain open for international tourism,” the company added. U.S. cruise companies and airlines will likely be affected by Bolton’s planned measures against “veiled tourism”, but most companies said they were still waiting for specific regulations before commenting. Meanwhile, a European businessman in Cuba suggested, on condition of anonymity, that foreign companies already established in Cuba are prepared. He said, however, that he expects his import business to be affected through rising unpredictability and insecurity in its relationships with suppliers and banks. What is hard to gauge is how companies considering to invest in Cuba are reacting to the U.S. measure. This entry was posted on Tuesday, April 16th, 2019 at 8:49 pm	and is filed under Top Stories. You can follow any responses to this entry through the RSS 2.0 feed. Both comments and pings are currently closed.